Instructor User Guide LessonsHow do I allow students to add content to Lessons? Click on the Lessons Page Title (e.g. Unit 8) in the Tool Menu to display the page. Click Add Content, then Add Student Content. Zoom: Click Add Content, then Add Student Content. 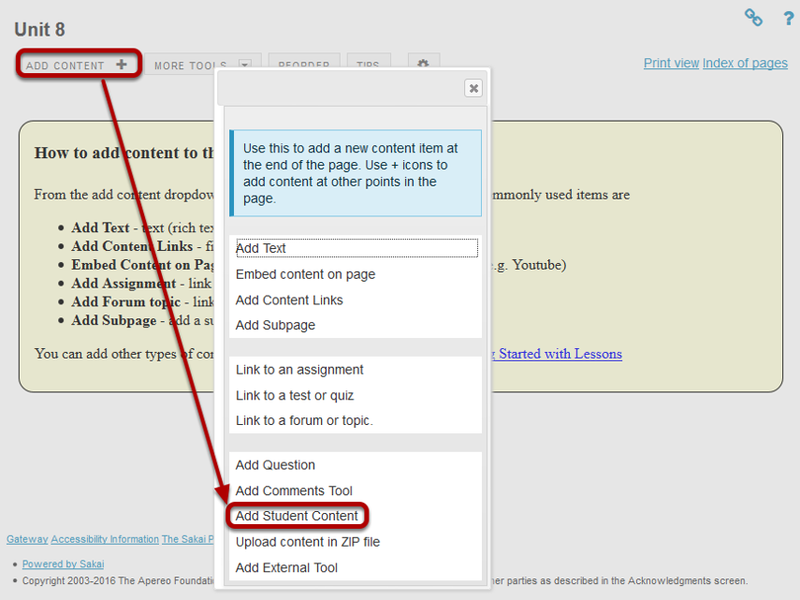 From the Add Content drop-down menu, select Add Student Content. Zoom: View Student Content Pages. Click the Edit button if you would like to modify the settings. Edit the Student Content Section Properties as needed. Zoom: Edit the Student Content Section Properties as needed. Check Anonymous if you want the student pages to not reflect the name of the student creating the pages. Check Create Gradebook if the student content pages are to be graded and enter maximum points. Check Add Comments if you will allow other students to comment on the student pages. Check Make These Comments Anonymous if you want student comments to be anonymous. Check Grade These Comments if you want to grade student comments on other student pages. Check Add a Peer Review Rubic to each page if you want to allow students to grade other student pages based on a rubric. Select a rubric. The Sample Peer Evaluation rubric (selected by default), or you may click Create a new rubric to create one. Set the Open/Due dates for peer evaluation. Check Student pages will be associated with groups rather than individuals to allow site groups (rather than individuals) to create Student Pages. 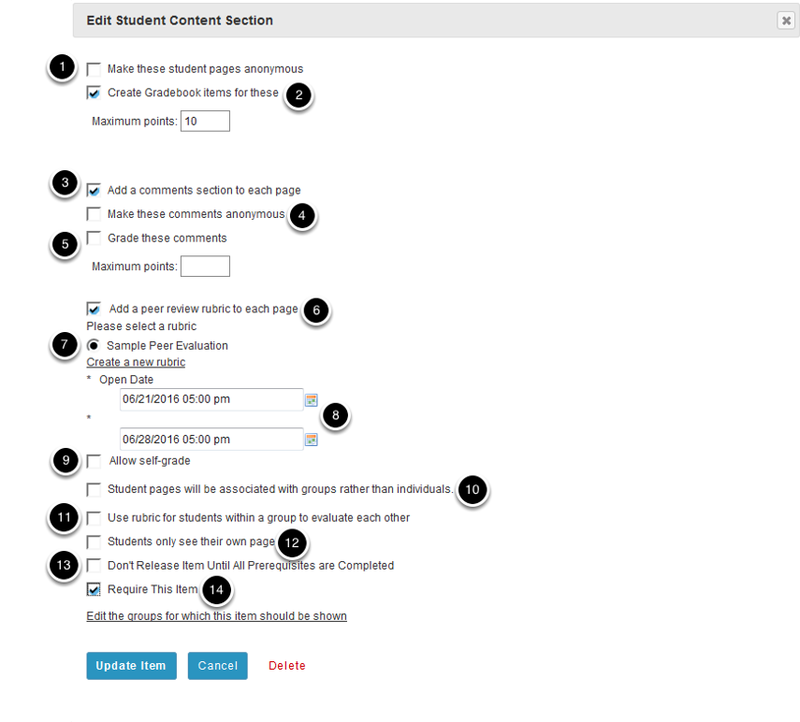 Each group member will be allowed to add/edit content on the group's Student Pages. Check the box for Use rubric for student within a group to evaluate each other if you would like groups to use rubrics. Check the box for Students only see their own page if you want the student pages to be visible only to the instructor and the author of the page. Check the box for Don't release item until all prerequisites are completed if you want to restrict access based on a prerequisite. Check Require this item to require the creation of Student Pages before moving on to a different Lessons item. Note: All of the settings listed above are optional. When finished, click Update item. Updating will return the display to the Lessons page with the Student Pages section shown. To view a student's page, click on the student's name. Zoom: To view a student's page, click on the student's name. Example of a Student Page. 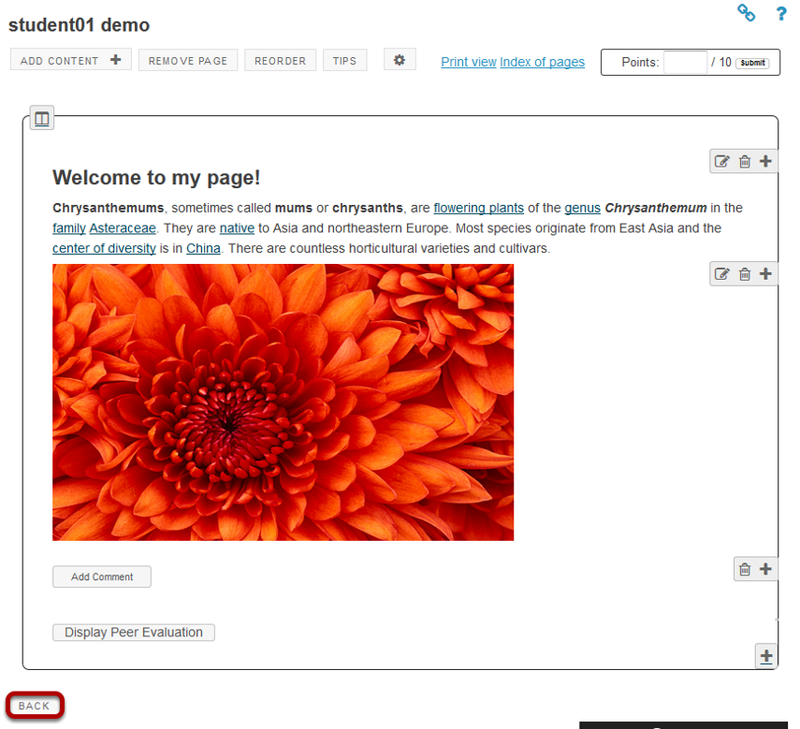 Zoom: Example of a Student Page. Students can add text, link to documents, link to web pages, embed images, embed video, embed audio, create sub-pages, add comments (if allowed) and peer review (if allowed). Click Back to return to the Lessons page. The Back button is located in the bottom left corner of the student's page. Zoom: Click Peer Evaluation Statistics. 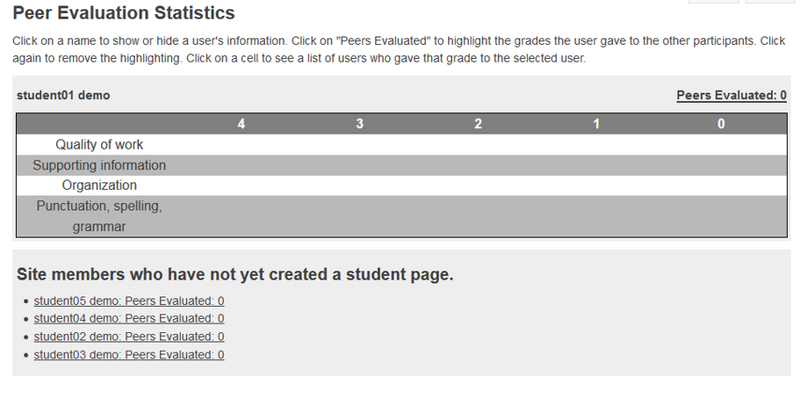 Click the Peer Evaluation Statistics button to see the evaluations made by other students (or self-evaluations). This will display the Peer Evaluations made by other students or the Self Evaluation (if selected in properties) based on either the default rubric (shown above) or your custom created rubric. Prev: How do I allow comments to be posted on a Lessons page? Next: How do I reorder items on a Lessons page?